We provide everything you need to give your dog a proper bath and you leave us the mess. Self service grooming is a new concept to most pet owners in our area. Once you give it a try you will be hooked and will recognize all of the benefits for you and your pets. A clean pet is a happy, healthy pet. We offer a stress free environment and an affordable option to using your hose or dirtying your bath tub to keep your pet clean. It’s a bonding experience for you and your pet. It is also a great alternative to leaving your pet for a professional grooming if your pet has special needs or concerns. Each semi-private station contains a professional, waist high, stainless steel tub with temperature controlled water for your dog’s safety and comfort. No more back strain over your bath tub or cold hoses outside. We provide stairs for your dog to get in and out of the tub. Now, not all dogs will use them, but there is always somebody here to help get even the most stubborn dog in. We also have an extra large tub available for our giant breed friends. 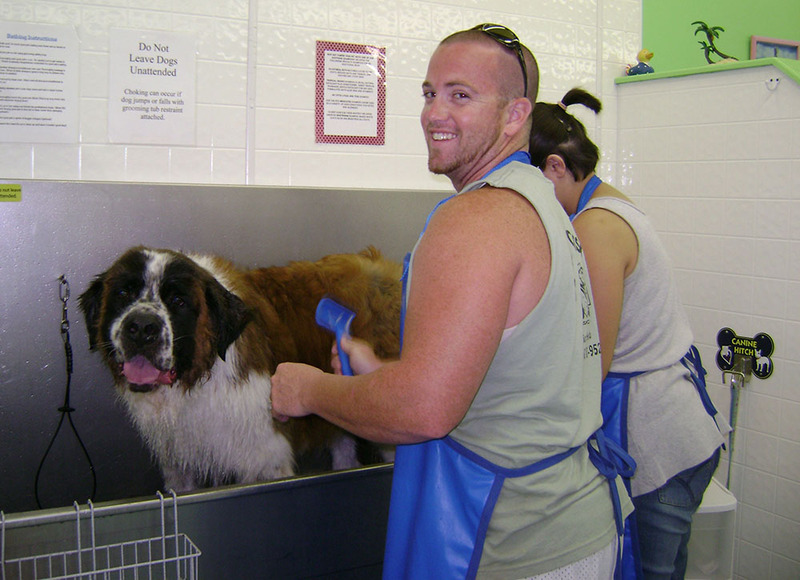 Each station is provided with the necessary tools to give your dog a proper bath. Aprons, shampoo, towels, ear cleaner and pads, rubber gloves, various brushes and shedding blades, grooming table, and a professional dryer. These are all included in your self wash.
For a little bit extra we offer specialty shampoos and can always cut nails.